Animal advocates gathered on the steps of City Hall in New York on Wednesday to reveal a disturbing string of incidents involving the city's controversial carriage horses. Records obtained from the NYPD detailed undisclosed accidents and alleged "hit-and-run" incidents between horses and other vehicles. The records, obtained by a request through New York's Freedom of Information Law (FOIL), cover a period of five years from Oct. 2009 to April 2014. Twenty-five incidents were described in a handout given out at the press conference. 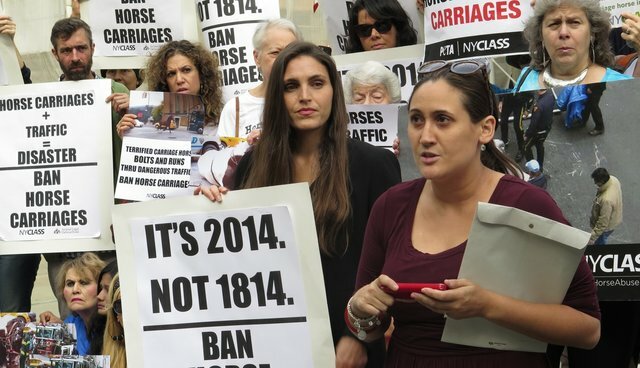 Among the carriage horse incidents over the past five years, there were at least 12 incidents during which the carriage driver allegedly fled the scene, referred to as "hit-and-runs" by Allie Feldman, executive director of the animal welfare group NYCLASS. 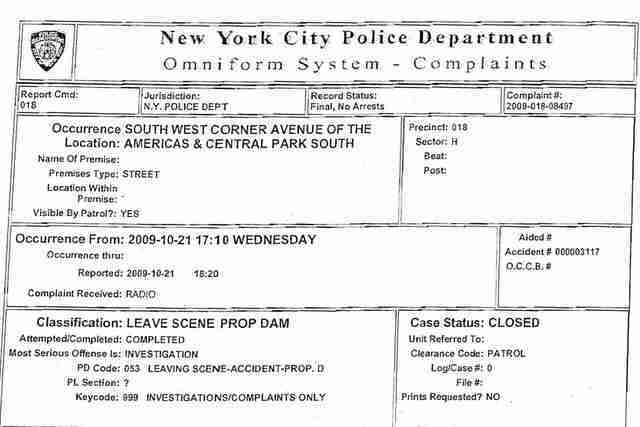 The records detail one 2009 incident during which a child riding in a horse carriage in Central Park fell out and was "rolled over by [the] wheel of [the] carriage." The child suffered injuries to the stomach, chest and head, and was taken to New York Presbyterian Hospital. Another incident reportedly involved a horse carriage who was hit by a taxi, after which the carriage driver fell out and was found "laying in the street not moving." Meanwhile, the horse involved got loose and ran down 59th Street, hitting two taxis and suffering a "possible broken leg." Councilman Ydonis Rodriguez, Chairman of the City Council's Transportation Committee, was at City Hall to show his support for removing the horses from New York's streets, saying that he wants his two daughters "to be raised in a society where we see animal rights [to safety] the same as human rights." He added that the City Council is working on a bill that would ban the horse carriages. "We will remove carriage horses from Central Park," he said. New York's Teamsters, which supports the horse carriage industry, was on hand at the conference as well. In a handout, representatives argued that "horse-drawn carriage travel is among the safest forms of transit in New York City." They added that when examining all forms of travel in the city, alleged carriage collisions account for less than 0.003 percent of all traffic collisions. Allie Feldman of NYCLASS countered this by saying, "This is an animal welfare issue ... 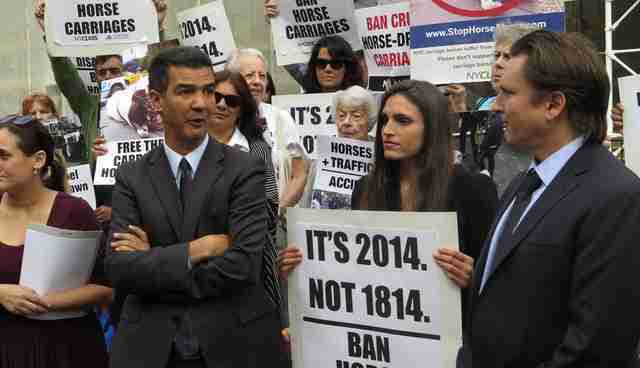 In a society like New York City, there is no number of carriage horse collisions that is acceptable." Collisions between horses and cyclists, food trucks, cars and parked vehicles are also detailed in the records. The Coalition to Ban Horse-Drawn Carriages, the Animal Legal Defense Fund (ALDF), Friends of Animals and PETA were also on hand to release details of the incidents. Before this release, only 20 horse carriage accidents were known to the public. In one shocking incident earlier this month, an escaped carriage horse was seen running down a busy city street, trailed by NYPD cars. Mayor Bill de Blasio promised during his electoral campaign to end the carriage horse industry in New York. In April, he announced on record that the horses would be off the streets by the end of the year, adding that a bill was being drafted in City Council to achieve the ban. No word yet on how that draft is faring. The city's horse carriages have been a point of contention between animal advocates, who say that a life working in the loud traffic and smog of the city's streets is inhumane, and carriage drivers, who say that the horses are treated well and support dozens of jobs. A solution supported by many was the introduction of the antique-style "eCarriage," a battery-powered vehicle modeled after a turn-of-the-century touring car. The carriage horse drivers could switch to these vehicles and keep their jobs, while tourists could continue to see the city in style. As for the horses, sanctuaries and farms will likely adopt retired carriage horses, and many have already offered to do so. Organizations like The Humane Society of the United States and ASPCA have offered to help with the transition as well. On the steps of City Hall on Wednesday, Feldman said that many different organizations have "pledged to provide adoption homes and lifetime funding for the care" of the retired carriage horses. Now, it remains to be seen when a City Council bill will, as Councilman Rodriguez said, get the horses off New York's streets.